Caddie Blair feels everything strongly--and so she works hard to keep her distance. It's the ethical thing for a journalist to do, especially in a war-torn region like the Middle East. And Caddie wants to believe that nothing is as important as covering "the story." There's room for passion in her life--but that's only physical. And Caddie keeps even those fleeting attachments under wraps, secretive, because she knows that when a journalist even appears to lose her detachment, she is already lost. So what is Caddie to feel when her lover dies beside her--shot in an ambush on the way to the next promising political interview, across the Israeli border into Lebanon? 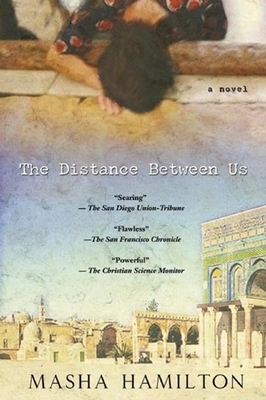 An authentic look at the emotional and ethical chaos within a war correspondent who becomes a bit too involved, Masha Hamilton's The Distance Between Us is a straight-ahead story of human passion--desire, conviction, and the guilt of a survivor--struggling for order within the frayed justice of the Middle East conflict. A seasoned journalist herself, Masha Hamilton brings to this revealing novel the sharp eye and deep empathy that marked her debut, Staircase of a Thousand Steps (BlueHen, 2001). Beautifully turned, and peopled with an astounding cast of characters who are as true as they are perceptive, The Distance Between Us is finally the portrait of one woman's search for the narrow pass between vengeance and emotional survival, when her only true attachment has been torn away from her. "If we knew where we were going to fall," the novel's most enigmatic character tells her, "we could spread straw."